This is a book about the social, cultural, economic and political aspects of digital technology and education. In particular it sets out to unpack the relationships between digital technology and compulsory education - i.e. schools, schooling and all other elements of the formal organised provision of education to children and young pcople. This is a book that attempts to make sense of what happens (and what does not happen) when the digital and the educational come together in the guise of 'schools technology'. The next nine chapters will identify and examine the key tensions and controversies that surround technology and schooling in the early twenty-first century, culminating in a set of suggestions, proposals and recommendations for addressing thc 'problems' that appear to beset schools technology. Above all, the book sets out to develop a critical understanding of all these issues — offering a counterbalance to the oftcn uncritical and unreflective academic study of educational tcchnology over thc past forty years. This book presents a wide-ranging and critical exploration of a topic that lies at the heart of contemporary education. The use of digital technology is now a key feature of schools and schooling around the world. Yet despite its prominence, technology use continues to be an area of education that rarely receives sustained critical attention and thought, especially from those people who are most involved and affected by it. Technology tends to be something that many teachers, learners, parents, policy-makers and even academics approach as a routine rather than reflective matter. Tackling the wider picture, addressing the social, cultural, economic, political and commercial aspects of schools and schooling in the digital age, this book offers to make sense of what happens, and what does not happen, when the digital and the educational come together in the guise of schools technology. In particular, the book examines contemporary schooling in terms of social justice, equality and participatory democracy. 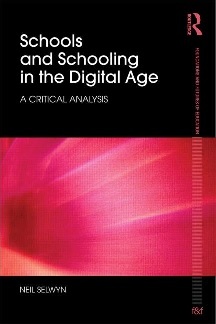 Seeking to re-politicise an increasingly depoliticised area of educational debate and analysis, setting out to challenge the many contradictions that characterise the field of education technology today, the author concludes by suggesting what forms schools and schooling in the digital age could, and should, take. This is the perfect volume for anyone interested in the application and use of technology in education, as well as the education policy and politics that surround it; many will also find its innovative proposals for technology use an inspiration for their own teaching and learning. Das Buch ist so klein gedruckt, dass weder meine Augen noch mein Zeilenscanner den Text vernünftig lesen konnten. Wären es nur meine Augen gewesen, so hätte ich dies meinem fortschreitenden Alter zugeschrieben. So hingegen ärgere ich mich über den Verlag, der das Buch auch nicht als eBook herausgibt.